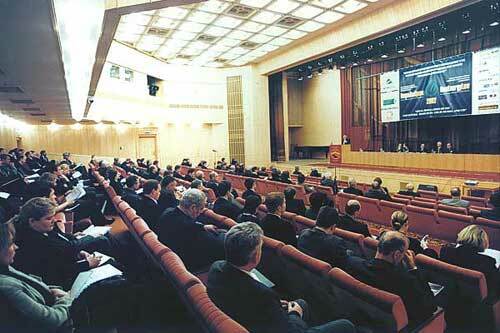 The Constitutive Congress of the USSR Union of Lawyers was held at the Palace of Congresses on June 22-23, 1989. It was attended by almost half a million of representatives of the legal community, which comprised legal professionals from law enforcement agencies and national economy. At the Congress there were 1047 delegates elected from all union republics. 905 delegates attended the Congress. The number of elected delegates included 140 representatives of judicial system, 133 lawyers engaged in national economy, 94 jurists, research workers and law teachers of academic institutes, 90 advocates. There were 53 doctors of law and 105 candidates of law among delegates. 130 delegates were women. Only 5 people of all the delegates had associate's degree - the rest had lawyer's diplomas. 94% of the delegates were communists. 6 delegates were deputies of the USSR Supreme Soviet. 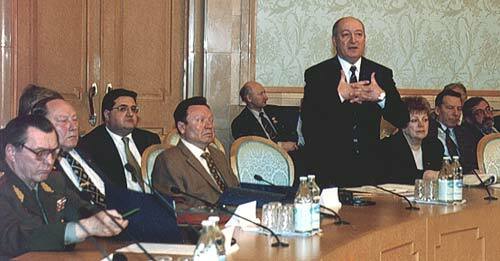 Head of the State Law Department of the CPSU Central Committee A. Pavlov, Chairman of the USSR Supreme Court E. Smolentsev, Prosecutor General of the USSR A. Sukharev, Chief State Arbitrator of the USSR Y. Matveyev and other chiefs of law enforcement agencies, judicial institutions and research institutions took part in the work of the Congress. Tadjik SSR's delegates proposed to begin with the moment of silence in honor of those who killed during the Great Patriotic War. The deputy Minister of the USSR Ministry of Justice M. Vishinski presented the paper "The USSR Union of Lawyers' Main Tasks under the Conditions of Formation Social Legal State". 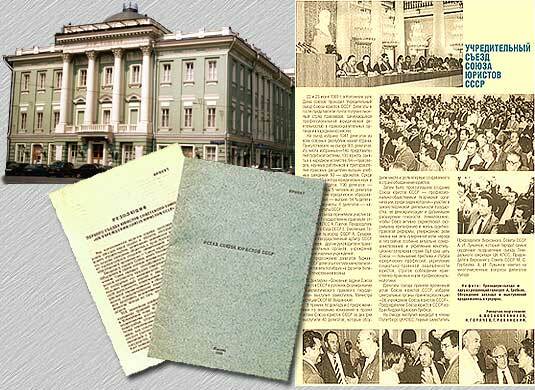 The paper was a subject of much discussion followed by propositions to move amendments to the Draft Charter of the USSR Union of Lawyers made by 40 delegates who spoke for two days discussing the place and the role of the first association of lawyers in the country. Then it was declared the creation of the USSR Union of Lawyers - nationwide organization of legal professionals. Some of its main objectives set forth were participation in the lawmaking activity of the state with the view to the expanding national democracy and glasnost. The organization's other main objectives included: promoting efficient realization of law reform, strengthening the Rule of Law in the context of people's sovereignty, perfection and strengthening constitutional order in the country as a timely move. The Union of Lawyers undertook to ensure higher prestige of the legal profession, socio-legal protection of lawyers, observance of moral and legal standards of professional ethics. The delegates adopted Draft Charter of the USSR Union of Lawyers, elected central bodies and adopted the resolution of "Establishing the USSR Union of Lawyers". 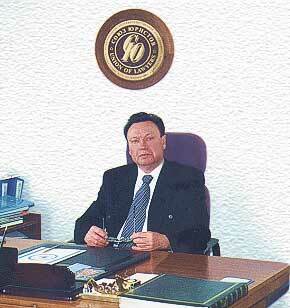 Andrey Adamovich Trebkov was elected as a Chairman of the USSR Union of Lawyers. At the Congress the participants were addressed by the Candidate for a member of the Political Bureau of the CPSU Central Committee, First Deputy Chairman of the Supreme Soviet of the USSR A.I. Lukianov who passed the most heartfelt greetings to the Congress from the Secretary General of the CPSU Central Committee, the Chairman of the Supreme Soviet of the USSR M.S. Gorbachev. At the Congress A.I. Lukianov answered various questions of the delegates. The International Union of Lawyers was established in 1989. 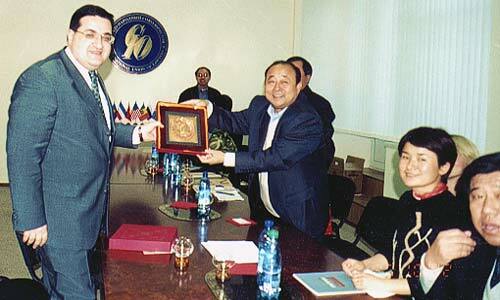 The Union exercises its functions and fulfils its purposes as a successor to the USSR Union of Lawyers. Membership in the Union is open to individuals without regard to their status as nationals or aliens. It shall be composed of professional lawyers as well as nationwide associations. Over 30 thousand lawyers and nongovernmental associations from Russia, the Republic of Azerbaijan, the Republic of Armenia, the Republic of Byelorussia, Georgia, Ukraine, the Republic of Kazakhstan, the Republic of Kyrgyz, the Republic of Tajikistan, the Republic of Moldova, the republic of Uzbekistan, Great Britain, the Federal Republic of Germany, Franc, Spain, New Zealand are joined on the base of general professional interests by the Union. Membership includes representatives of legal professionals: judges, advocates, prosecutors and notary publics, lawyers engaged in business structure and public system, law teachers and scholars. The Union comprises important nongovernmental associations. In particular, the Russian Association of International Law, the Association of International Maritime Law, the Criminological Association, the International Russian Bar Association and others. The Union has an administrative and a policymaking structure, which comprises: a Chairman, Coordinating Council, Executive Committee and Auditing Commission. Union's activities are based on the enlisting of the members in the composition of the Union of Lawyers' standing commissions. One of the main tasks of the Union of Lawyers is to unite the lawyers of the CIS countries and other countries with the view to the development of cooperation among them. The Union of Lawyers strives to make a contribution to formation of civil society. It shall promote consolidation of legal community with a view to the achievement of civil harmony, protecting rights and legal interests of citizens and strengthening business relations among practicing lawyers and scholars of the CIS countries. The Union of Lawyers does in fact often look to foreign experience and to experience of countries with the developed legal base of market economy. It always focuses its attention on providing legal aid to economic reforms. As a result the Union of Lawyers has successfully hosted numerous international conferences, seminars and symposiums providing a forum where individuals from all nations and all areas of legal profession could gather and exchange ideas and experience. Mr. A.A. Trebkov, Honored Lawyer of the Russian Federation, Candidate of Law is the Chairman of the International Union of Lawyers. "The International Union of Lawyers"